If you think that the motor-driven selfie camera is the highlight of the new Vivo NEX, whether with the addition A or S, you are mistaken. Because also in the display hides an important and hopefully soon to be widespread smartphone technology: the Super AMOLED panel also becomes a loudspeaker. When you take the Vivo NEX in your hand for the first time, the huge 6.59 inch display with super AMOLED panel can't help but catch your eye. This screen comes courtesy of Samsung's display division and covers 91 percent of the Vivo NEX's front. If you take a closer look, you will notice that the bezel below the display is slightly wider. This is because parts of the control electronics are located there. The format of 19.3:9 is very unusual, and the resolution of 1,080 x 2,316 pixels is not so common. Both in combination deliver a pixel density of "only" 388 ppi. In times of values beyond 400 ppi, you might think that the Vivo NEX's display is not the sharpest or shiniest. But don't be fooled by the values, because the Super AMOLED panel shows itself here from its best side and offers the deepest black and sharp, fine lines. The Vivo NEX should satisfy notch-haters, as it has no screen notch at the top because the speaker and the front camera were cleverly concealed. Thanks to the AMOLED panel manufactured by Samsung, the Vivo NEX display offers the usual high contrast combined with vivid and balanced colors. Our graph shows that the display consistently covers the sRGB color space very well, but unfortunately the Vivo NEX display fails with the DCI-P3 color space. Subjectively seen, the display does not afford any outliers and can still display contents clearly visible in direct sunlight. Our measurements show the Vivo NEX A display a maximum brightness of 478 nits. This is not a spectacular figure, but it is average. What makes the Vivo display so special is not the quality of the content, but a feature that has not been emphasized enough so far: the display turns into a loudspeaker for voice calls! If you want to fill the room with sound, there is still a conventional mono speaker in the lower frame. This technology offers two advantages: On the one hand, the recess for a call speaker is omitted and on the other hand, the display can move even closer to the edge of the housing. The second advantage is that you only have to hold your ear somewhere near the display to hear the person you are talking to. Isn't that neat? But, it's a pity that Vivo doesn't use a third advantage of the sound-emitting display. Unfortunately, the Vivo NEX does not have IP certification, which was probably prevented by the motor-driven selfie camera. 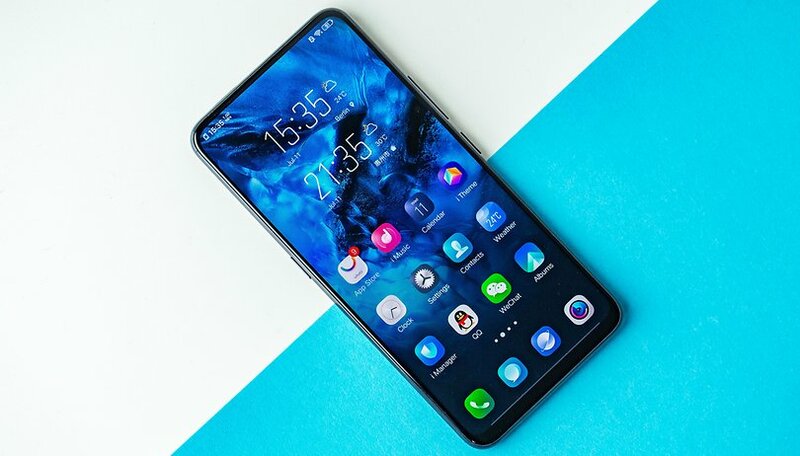 The display of the Vivo NEX stands out for its enormous size. Vivo has a very good display supplier in Samsung, which has proven to produce super AMOLED panels with excellent contrast values, rich and vivid colors and good brightness. But the real icing on the cake has to be the sound-emitting panel. Who's the best display maker in the business, you got it Samsung. There is no finer. They play second fiddle to no one!